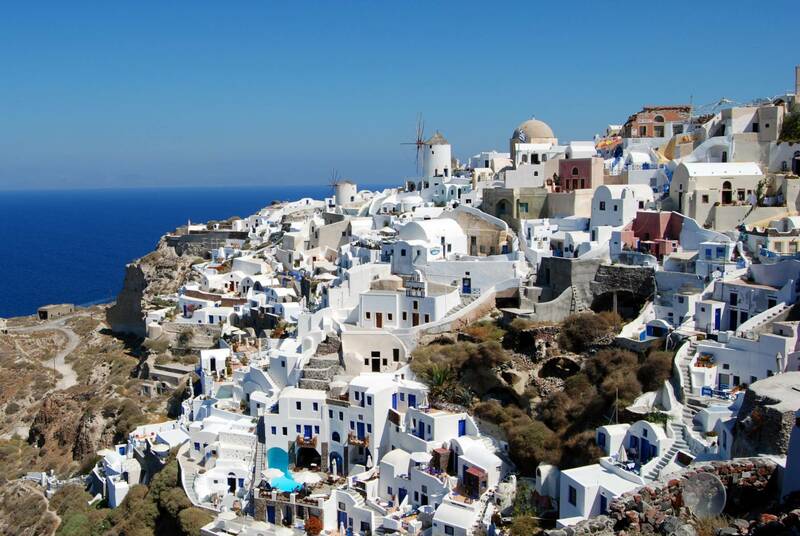 Oia is situated on the best spot of the island. The caldera is on your north-west, and as you go downhill towards the north-east beaches of Oia, you pass through the cultivated areas and the famous vineyards, and you reach the Baxedes beach. The Sun Anemos resort stand in this special natural habitat, in front of the Baxedes beach. If Fira is the flashy side of the island, Oia is the elitist one. Here you can let yourself in nature’s magic hands. The endless view and the open view of the Aegean Sea and the nearby islands, the rough rocks of the caldera, the sea breeze, the small white houses carved on the cliffs, the thousands of colours that paint the sea and the sky when the sun sets, stimulate the senses. It is not by chance that people from all over the world come only for the Oia’s sunset. 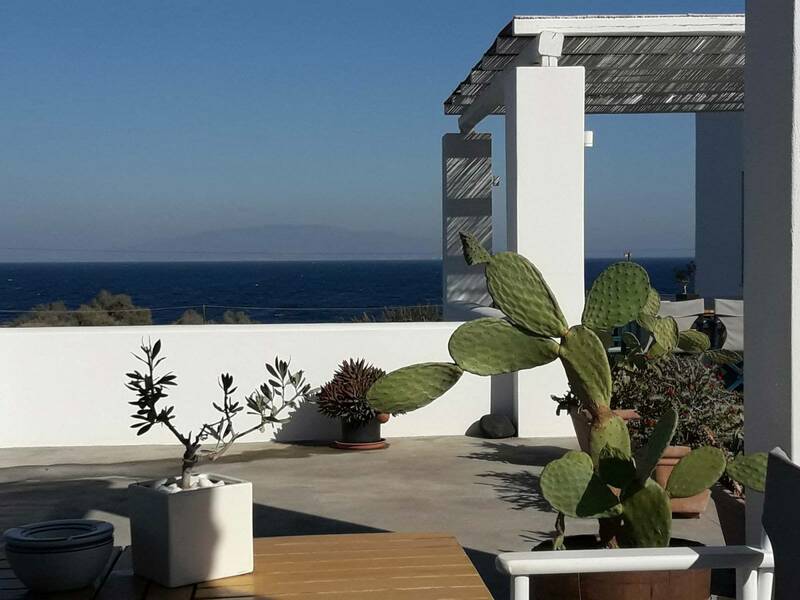 The Sun Anemos resort is 3,5 km from Oia village, 9 km from Fira, 12 km from the airport and 16 km from the port. You can reach us by car, choosing either the mountain route from where you can admire both sides of the island (west and east), or the coastal route. The first one has more bends, while the second one is shorter by 3 kilometres. Santorini is the southernmost island of the Cyclades group of islands and it can be reached both by aeroplane and coastal lines. It is also connected with the other islands of the Cyclades on a daily basis. From Pireaus port, it takes approximately 5 hours to reach by high-speed boats, while by conventional boats it takes approximately 8 hours. In the summer season the number of itineraries increases. Airline connection takes place with regular every-day flights from the El. Venizelos International Airport of Athens, both by Olympic Air and Aegean Airlines or by charter flights that come from all over the world during the summer season. The flight takes about 40 minutes. The vineyard of Santorini is considered to be the most historic of Greece and perhaps the most ancient in Europe. The secret lies in its unique ecosystem. The soil, the climate, the sea and the volcano, which last activated in the 50’s, with its hot breath, have marked this unique island. Let us not forget the underwater volcano in Columbo. This particular climate and the volcanic soil protect the vine from diseases, insects and fungi. In this way, diseases that have destroyed all the vineyards of the planet, haven’t been able to damage the vineyards of Santorini; so the grapes harvested today are the same our ancestors harvested. The vineyards may be 60-80 years old, but their root system dates from ancient times. Moreover, the winegrowers of Santorini have adopted and brought to perfection an ancient trimming technique, the “kouloures”. The vines are trimmed in the shape of low-spiralling baskets, with the grapes hanging inside to protect them from the strong winds. A black, sandy beach, which is decorated with small lilies in mid August, puts the finishing touch. The very same lilies can be seen on the wall paintings in Akrotiri of prehistoric Thera.